4 Wheel Madness 4 Wheel Madness Drive your monster truck over hills of dirt, cars and other things to accomplish the task given. American Racing American Racing Compete in loads of events in a Stock Car racing calendar, race up to 60 other cars in this all-contact racing game. American Racing 2 American Racing 2 American racing is back in American Racing 2, this time with more events, bigger crashes and even more cars to race against. American Tow Truck American Tow Truck Navigate the busy city in your tow truck to collect cars and transport them to the compound. Binga 3 Binga 3 Part 3 of the Binga series. Play with tennis balls, miniature cars, solve codes and lots more random tasks. Boost Up Your Car with Harry Boost Up Your Car with Harry Help this girls to tuning their old cars. Car Color Collector 2 Car Color Collector 2 Race against time to get all cars fresh color as fast as possible. Car Eats Car 2 Deluxe Car Eats Car 2 Deluxe Who could ever think that little cars can fight with monsters? Car Eats Car 3 Car Eats Car 3 Eat up all of the other cars. Carbon Auto Theft Carbon Auto Theft Break the cars lock, then drive it out of the parking lot without crashing within the time limit. Cargo Shipment Chicago Cargo Shipment Chicago A unique take on the tower defense genre. Load up the cars! Cars VS Zombies Cars VS Zombies Drive the cars into the zombies in this clever puzzler! They really underestimate the zombies in these games. Chicago Car Parking Chicago Car Parking Crisp challenges like parking cars at the ever busy cities like Chicago is some task. Coil Defence Coil Defence Here are many kinds of cars for you to fight and you can hear the sound as real. Join us and let's have a fierce fighting! Corrupt Cop Corrupt Cop You control a police car in an overview 3D world where your main objective is to destroy the cars around you. Create a Ride V 1 Create a Ride V 1 If you are into import cars then you will love this. Here you can customize cars and even drive them! Danger Speed Danger Speed In the racing game Danger Speed, you need to collect bonuses, win prizes and money to buy upgrades and new cars. Demolish Truck 2 Demolish Truck 2 Drive your truck, collect all the stars, trash the other cars under your massive wheels and try to beat the high score! Desktop Racing 2 Desktop Racing 2 The amazing Desktop Racing is back for another ride! More cars, awesome upgrades and lots more racing fun! Dodge And Crash Dodge And Crash Dodge the cars in traffic to get to your target and crash it. Driving Warrior Driving Warrior Get stuck into the road rage action, destroy other cars and get to the checkpoints before the clock runs down. Electric Racing Electric Racing Participate in Electric Racing with your powerful electric car, accelerate and crash on opponent cars to charge your car! Expert Parking Expert Parking Drive your car slowly as you maneuver and pull into your parking spot without hitting other cars. Factory Parking Factory Parking Factory Parking challenges you to park as many cars as possible before the timer reaches zero. Garage Tycoon Garage Tycoon Follow the instructions to turn this garage into a goldmine by repairing, tuning, painting, and washing customers' cars. Global Rally Racer Global Rally Racer Race your sports car around the world in 8 races against other cars. Highway Racer 3D Highway Racer 3D Select and customize your cars and win races to earn money to buy new cars. Hot Rod Racing Hot Rod Racing Race the AI opponents as you buy & upgrade cars. Use nitro as you lean & tilt. 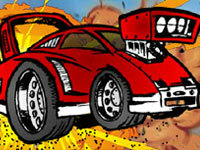 Lost Race Lost Race Learn to take out other cars without damaging your own ride in this race to destruction. Mafia Driver 2 Killer Mafia Driver 2 Killer Drive around following the circle objectives. Dodge objects and cars. Grab money symbols. Mega Truck Mega Truck Smash some cars in your badboy monster truck!